Significant growth has been seen in the awareness of face fit testing since its introduction to the COSHH (Control of Substances Hazardous to Health) 2002 Regulations. COSHH covers chemicals, products containing chemicals, fumes dusts, vapours, mists and gases, and biological agents. So, following the legislation, all UK employees who wear tight-fitting respiratory protective equipment (RPE) should have a certificate to prove that the facepiece they wear during work fits their face and provides the protection necessary for them to perform their work safely. Fit test reports should be available for all employees who wear RPE that have tight-fitting facepieces. Fit test records should be retained by the employer for a minimum of five years and must be kept available for inspection on request. Inspectors will ensure that a management system exists for correct selection, use, storage and maintenance for RPE. They will ensure that the selection process has included an appropriate face fit test. They will ensure that the fit test certificate is valid and relates to the correct RPE and the wearer. To establish the authenticity of the fit test certificate, the facepiece in use will be compared to the details recorded on the fit test certificate, and by cross-checking the details on the fit test certificate with those retained by the fit test provider. The inspectors will also ensure that the RPE in use is the same make, type and size as the facepiece worn during the fit test. Finally, the inspectors will check the RPE is clean and well maintained. Inspectors will deem the RPE unsuitable when the wearer of a tight-fitting facepiece has not undergone and passed an appropriate fit test, where the fit test results are not readily available, or where the results show that a particular facepiece did not fit the wearer and the wearer is continuing to use that type and size of facepiece. Advice will be given to select a more appropriate facepiece and to undergo testing. It is not necessary for employers to issue personalized facepieces following fit testing. Employers only need to ensure that the facepiece that is given to an employee is the same make, model, type and size that their employee wore when they were successfully fit tested. As such, if an employee intends to wear more than one type of facepiece, then he or she must undergo a fit test for each type. Tight-fitting facepieces rely on achieving good contact between the wearer’s skin and the seal of the facepiece. As people come in many shapes and sizes, it is unlikely that one type of mask will fit all. A poor fit will reduce the level of protection and can lead to immediate or long-term ill health for the wearer. When you pass the face fit test wearing the same facepiece that you will use for your work, only then will you receive a certificate to wear that facepiece for work. If you fail the test, the tester will ask you to refit the facepiece and repeat the fit test. If the fit is still unsatisfactory, you may be asked to try a different size and repeat the test. You will not pass the test and receive a certificate if your facepiece doesn’t fit. The fit test is also useful for checking that a wearer can put on and adjust a RPE correctly. 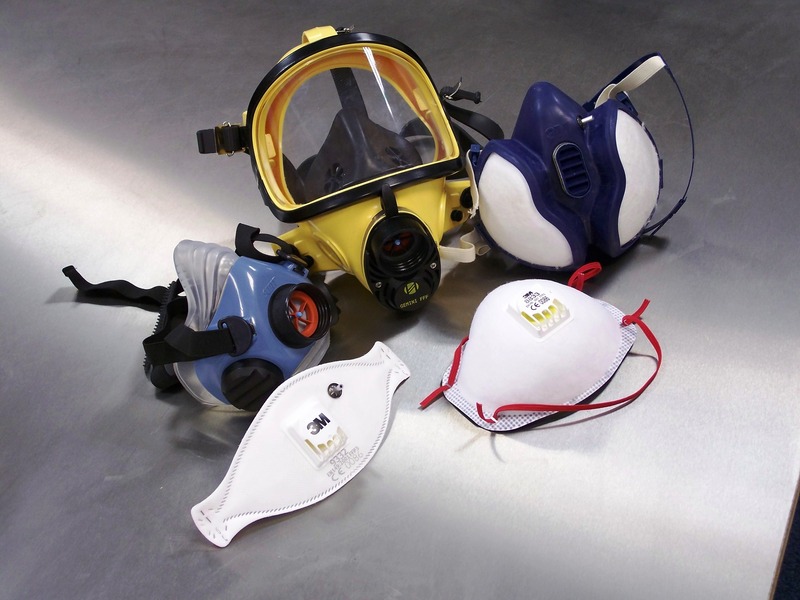 Correct fitting of the facepiece is vital to prevent the inhaling of a hazardous substance. A face fit test should be carried out as part of the initial selection of the RPE or when an untested facepiece is in use. When RPE is used on a regular basis, it is recommended to carry out repeat fit testing. For those involved in asbestos removal, annual testing is recommended. In any case, a repeat fit test should be carried out if the wearer loses or gains weight, undergoes any substantial dental work, or develops any facial changes (scars, moles) around the facepiece seal area. Also, a repeat test should be conducted where the employer’s health and safety policy requires it. RPE is used to protect you from inhaling hazardous substances. It should be used when you might still breathe in contaminated air despite other controls you have in place, when there is a risk of short-term or infrequent exposure and other controls are impractical, whilst you are putting other controls in place, when you need to provide RPE for safe exit in an emergency, when you need RPE for emergency work, and when emergency rescue in a hazardous environment is necessary. It is not permitted to wear stubble or a beard during a face fit test or at any time when you wear your facepiece. You must be clean shaven. The only exception is if the facial hair is enclosed entirely within the facepiece and no facial hair touches the facepiece seal area. The main output of a fit test is a personalised report which states whether the test was a pass or a fail. Some test providers refer to this report as a certificate. Amongst other details, this report clearly states the name of the person tested, the make, model, type and size of the facepiece, the date of the test and the result.